In my basic high school economics course, we've always used supply-demand curves that are lines to simplify calculations. In real markets for real goods, what do the supply and demand curves look like? From a mathematical perspective, what would be the concavity, asymptotes, and intercepts? I would imagine the quantity demanded would tend to zero as the price increased to infinity and the quantity demanded would grow very large as the price approached zero, but that is just what my intuition tells me. 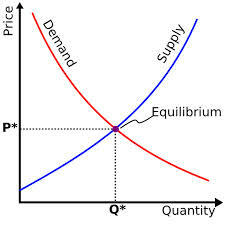 The straight-line supply and demand curves can be thought of as a magnification of this graph, where the two intersect. Thus, the units on the axes would give you a clue as to how high up the graph is being drawn, or how far to the right (if the units start at a number other than 0 or skip an interval). This shows you why they are indeed called 'curves', even when they are sometimes straight lines. Supply and demand curves are drawn using straight lines for simplicity. For example, two straight-line equations may be given, from which it is relatively simple to calculate the point of intersection. Supply and demand curves are an approximation of what happens in real life. The curves are a simplified model which show the general trend in the two functions. In reality, supply and demand curves are approximated using data that is collected over many years, with many short-term variables affecting the results, if the curves are even drawn up at all (the curves are more a theoretical model than a calculative method). 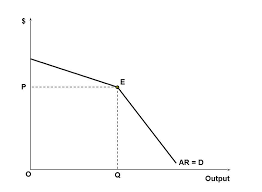 Price elasticity at different points of output affect the gradient of the curve at those points. A higher price elasticity results in a shallower gradient and vice versa. 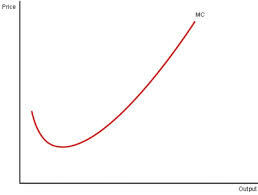 A unit price elasticity at all points on a demand curve will result in a hyperbola. In that case, the asymptotes of the demand curve are the x and y axis. FYI, the asymptotes of a demand curve will always be the x and y axis if the graph is drawn using this definition of price elasticities, but different elasticities will change the compression or expansion of the graph either vertically or horizontally so that it becomes not a hyperbola, but a hyperbolic graph. However, due to the firm's variable costs, output is always greater than that at the turning point of the marginal cost curve. What lies behind supply and demand model?